On vacation, I like to hike predictable trails that leave me feeling competent, independent, and pleasantly exhausted. 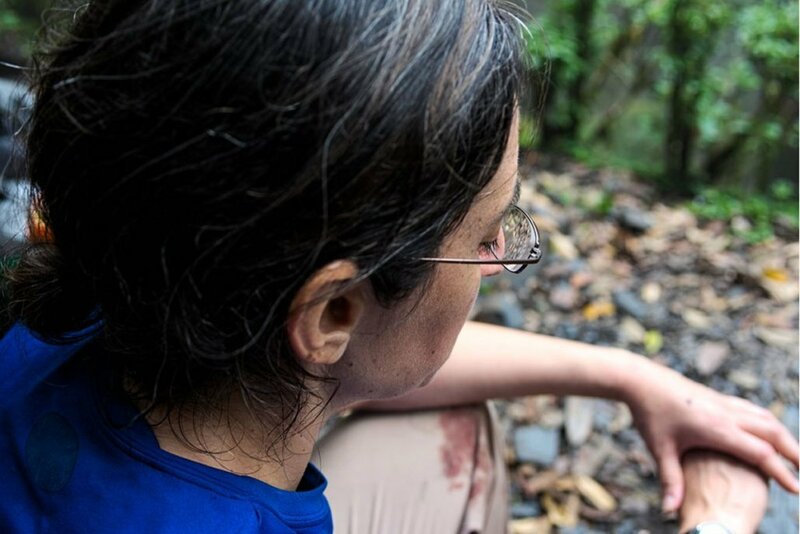 But as I trekked through the Nepali jungle, legs bloody and socks soaked with rain, it seemed the hills and cliffs were colluding to kill any wayward intruders. The first night, he peeled a leech from my hip; several more strained toward us from our tent’s mesh, searching for flesh to bleed. 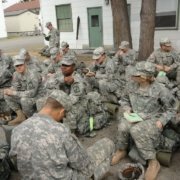 The next day, we walked in a downpour on trails that had barely recovered from lethal earthquakes two years prior, to which the US military had responded. We picked dozens of leeches from our ankles, shins, and thighs. Boyan carried a secondhand rucksack patterned in digital camouflage. It had been my gift to him, though I was the one who’d earned a Marine Corps commission back when he was an Eagle Scout. Between us, we carried a hundred pounds: rice, water, tent, pressure cooker, long johns, sleeping bags. Our second afternoon of climbing, we lost the trail. My glasses fogged and rain sluiced sweat into my eyes. Naïvely, I’d tucked a novel into the top flap of my pack back home. At a waterlogged pound and a half, it was too heavy to carry further. I yanked it out, dumped it into a patch of greenery, and tried to ignore the irony of its title: The Woman Who Lost Her Soul. As the second day’s sunset loomed, we found a rock overhang under which to camp. I accidentally broke a piece off the tent’s top while setting it up, and one side caved in. In the morning, after finding the trail, we saw an empty hut surrounded by prayer flags, and just beyond it, the remnants of a landslide. We’d have to cross it to reach our destination: a pass a few kilometers away. Boyan led, and I bear-crawled sideways across sandy rockfall. 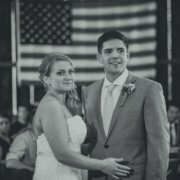 When my heavy pack shifted, panic rose in my chest. We made it to a small hollow in the middle of the landslide, the size of a couple of bathtubs. Five feet away, the slope dropped off sharply. I didn’t look down. Boyan volunteered to scout the way ahead while I caught my breath. I sat, terrified, looking only at the rocks next to me, not following the pebbles that skittered into pine treetops and thin air. Though I’m not normally afraid of heights, I didn’t want to see how far up we were, how much my safety depended on my balance and the strength of my grip. This landslide was the likely result of a 7.3-magnitude aftershock of a 7.8-magnitude earthquake two and a half years earlier. The quakes had killed over 8,800 Nepalis. 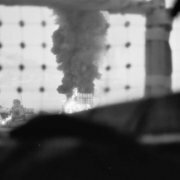 The day of the aftershock, a helicopter carrying six U.S. Marines, two Nepali soldiers, and five civilian evacuees had crashed about 10 miles from where I now sat, shivering. The Marines had just delivered 3,000 pounds of blankets, rice, and tarps to a nearby town, Singati. According to the U.S. military’s accident investigation, the pilot had picked an unfamiliar but more direct route to Kathmandu—not because it would be more interesting, like Boyan had, but more likely because the injured needed urgent medical attention. 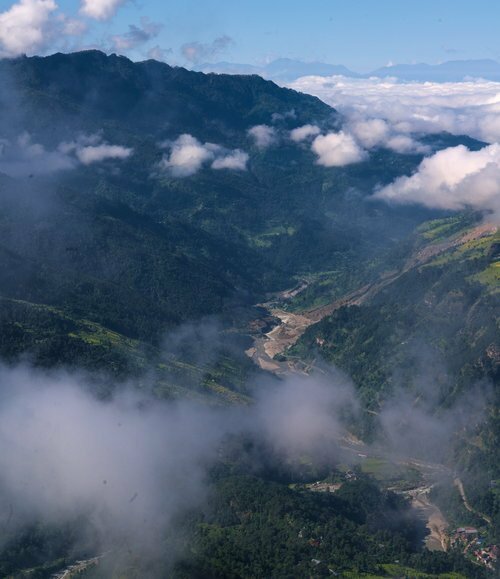 Hindered by rapidly changing air currents and clouds, they’d crashed into a ridgeline near Kalinchowk mountain. Kalinchowk was a few ridges over from us. We’d reached 3,100 meters, the same altitude as where the helicopter had gone down. 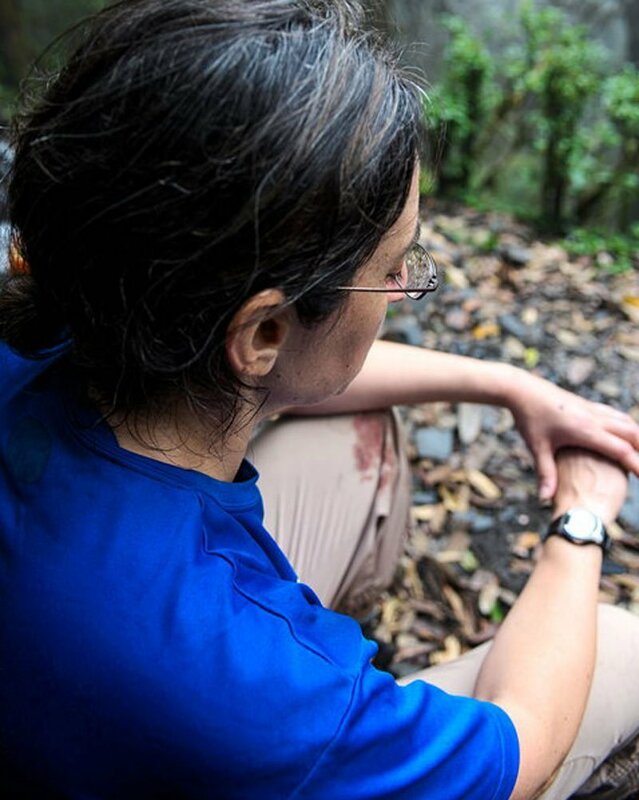 It had taken three days for rescuers to locate the wreckage in the thick jungle. Now I knew why. As clouds moved in toward my little gully, I started panicking. This was a real-time tutorial in how quickly visibility could drop. A minute later, I saw Boyan’s arm wave over a dirt mound, and he yelled that he’d found a route across the landslide. Still, I feared for my life. I had to speak up. I told him I wasn’t going any further, that I wanted to turn around. To his credit, he didn’t argue. 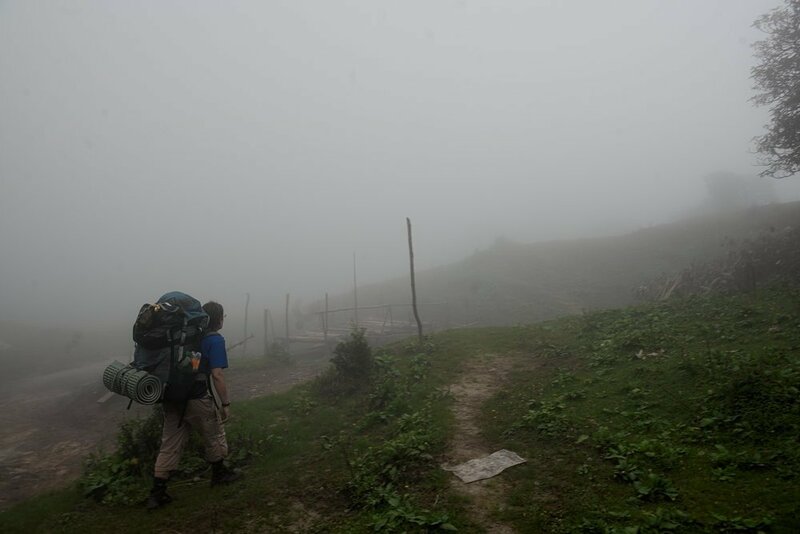 We carefully backtracked over the landslide, to a three-room hut encircled by prayer flags. 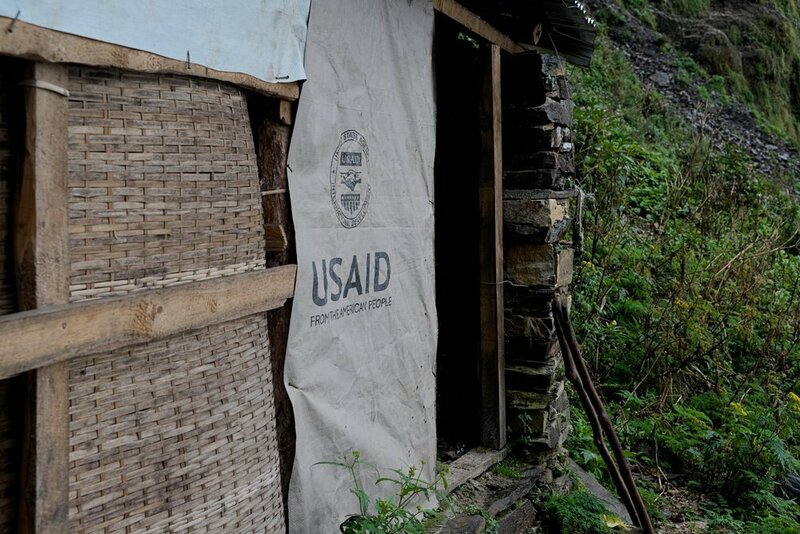 A tarp stamped USAID protected one room from the intermittent drizzle outside. We hatched a new plan to walk north and find the main highway. After an hour’s hike, thunderstorms turned to hail. We bushwhacked through stinging nettles and crossed a thigh-deep river where I gashed my leg. As twilight threatened, the trail disappeared; steep rock faces sidewalled the water. We backtracked to flat ground, slid our last sets of dry clothing from Ziploc bags, and spent that night on the riverbank, rain pelting our sagging tent. I’ll admit I’d approached the trip with more blithe assurance than I should have. Since my service ended 12 years prior, I’d always assumed I could throw a pack on my back and out-hike my partner. Yes, back at the Basic School, I’d slept in freezing puddles, and in Iraq, I’d managed five hours a night on a nylon cot. But now, I needed ibuprofen, rest, and to be reasonably sure I wouldn’t fall to my death or drown. In the Marine Corps, I hadn’t had a choice of whether or not to do something I knew was dangerous. Now I had the privilege of choosing to admit defeat. The following morning, we retraced our steps through still-wet jungle and followed a path we’d missed two days before, glimpsing Tibet’s snowcapped mountains five miles north. Hours later, three men strode by us with logs slung over their shoulders. They’d hand-felled trees into timbers for new houses. Their younger brother, Sunil, carried nothing, but spoke English. When he learned we were American, he said, “allo-ca-tion,” sounding out the syllables with care. “My brother. He got an allocation. USAID.” He walked us back to their tiny village, a collection of stone cottages. We sat on a low wall and removed our wet boots. Blood streamed from our leech-bitten shins. Boyan’s feet were white and wrinkled, the beginnings of immersion foot. Sunil’s mother handed us buffalo milk tea in metal cups. On the grass sat a toddler girl who must have been born after the earthquake. Wearing a sweatshirt emblazoned “New York,” she pulled apart a fist-sized marigold blossom and tossed petals into the air. As the sun dipped into a yellow sky, Sunil’s older brother offered us a place to stay. His house comprised a single large room with a corrugated metal roof. His wife squatted over the cooking fire, wearing a traditional long black skirt and apron. She blew the flames to life and made us dal bhat, or lentils and rice, and set chunks of fried ox meat on a tin plate. Sunil handed us small green fruits, tart and citrusy. Then he pulled a cracked smartphone from his pocket and offered to friend us on Facebook. Late that night, snug under blankets, I listened to rain patter on the roof. Humbled by the same land that had claimed my fellow Marines, I said a silent prayer of thanks that the villagers had taken us in. Later in our trip, on our way to altitude, we braved a 12-hour bus ride from Kathmandu through Singati, the bazaar town from which the ill-fated helicopter had taken off. The driver navigated tight switchbacks on half-paved roads, our bus wheels so close to cliff edges I didn’t look down. When we arrived in Singati, wood-framed storefronts lined the streets, carrying the same off-brand coconut cookies and sacks of rice for sale as in other roadside towns. Weeks later, back in the States, I saw photos of Singati from just after the earthquake: a mess of scattered pick-up sticks. From there, a helicopter flight to Kathmandu would last just shy of half an hour. One could be forgiven for thinking it’s easier to fly over this rugged terrain than hike or drive. Most days, it probably is. But not every day. The Marines performing humanitarian assistance in 2015 did not have the option of turning back when the going got rough. In their attempt to save lives, they accepted the risks of an unknown, but more expedient, route. When Boyan and I stumbled from those same hills, bleeding and famished, we were helped gladly by those who could afford it in part due to the efforts of Americans who had died rendering aid. These days, I am learning to be patient when I run into trouble along an unexpectedly difficult path; even “more direct” ones, like the Marines took, can have catastrophic consequences. It turns out I’m always on an unpredictable trail, one along which I must periodically admit defeat and accept help. It’s not a simple vacation hike. But it is more interesting. 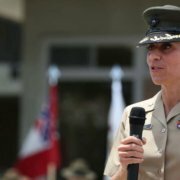 Teresa Fazio served in the United States Marine Corps as a communications officer from 2002 to 2006, deploying once to Iraq. Her writing has been published in The New York Times and Rolling Stone, among other outlets.